Monday’s can be tough. You’ve just spent two days free from your desk, emails, working lunches, and general responsibility, only to have to return and do it all again for five full days. Thankfully, Wendy’s is here to help you curb your latest case of the Mondays with a new deal for $1 Jr. Bacon Cheeseburgers. 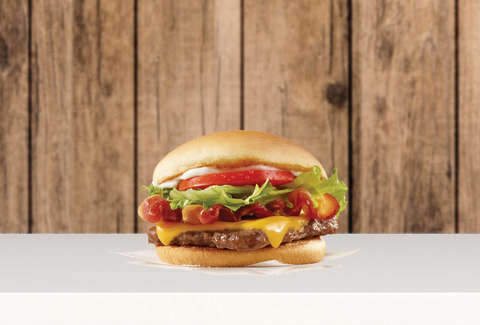 To cash in on this deal, all you have to do is order something online or through the Wendy’s app, and you’ll be able to add a Jr. Bacon Cheeseburger to your bag for a dollar. The deal is only good from now until Tuesday, March 19, so you’ll have to cancel your existing lunch plans fast. Then again, this isn’t the only deal Wendy’s is serving up right now, so maybe don’t sweat it. As if scoring a Jr. Bacon Cheeseburger on the cheap isn’t sweet enough, Wendy’s is also teaming up with DoorDash to offer users a free $5 Biggie Bag. The bag, part of a March Madness-themed promotion, includes Wendy’s new Bacon Double Stack, a 4-piece order of chicken nuggets, small fries, and a small drink, all for the low, low price of… nothing. To get yours, just apply the promo code FREEBIGGIEBAG after you add yours to your cart on the app, and your bagged buffet will be in your hands in no time. Just when you thought victory couldn’t get any sweeter, here comes the new Biggie Bag. Get a free Biggie Bag and free delivery with orders over $10. If that’s not your thing, you can still score a serious deal from Wendy’s and DoorDash. If you order $10 worth of Wendy’s from the delivery service, you’ll get your food with no delivery fee. There are no hoops to jump through and no promo codes required. Just load up on your favorite items and watch the delivery fee disappear. It’s lunch magic. You won’t be able to cash in on the DoorDash deals and the $1 Jr. Bacon Cheeseburger deals at the same time, but either way you slice it, you’re getting more bang for your buck. That, in itself, makes it worthwhile. Whether you’re planning to take advantage of a cheap burger, free sack of greasy food, or free delivery, feel free to treat yourself. It’s Monday after all.